We've finished our first letter of the alphabet as we continue eating our way through every restaurant in Ithaca from A-Z. In this episode, we'll discuss two locations of Arby's, the spicy world of options at Asia Cuisine, and catch up on the one restaurant we missed at the start. We've also got some news about new restaurants on the scene. Don't forget to follow along with the master list (see the link on the right sidebar of the blog) and if you find something we're missing, send us an email, leave a comment, or give us a call (206-312-4746) and let us know. Share your candid thoughts about the restaurants we're reviewing and feedback on the show. We look forward to hearing from you! We had a visit from our Chicago friends and fellow podcasters, Sous & The Chef, this week. Like many former Ithaca students and residents who come back to town, it isn't long before they feel an overwhelming hunger for the legendary local concoction known simply as Hot Truck. For those of us who live in Ithaca full time, it is easy to take dining institutions like the Truck for granted. Often it's only when you hear someone who's been away wax rhapsodic about the Truck that we are reminded just how much wonderful eating we have in Ithaca. 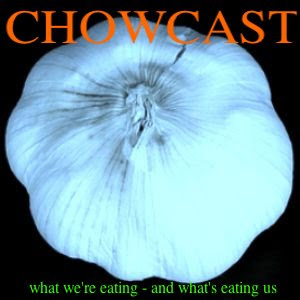 I encourage you to download their latest episode, recorded live in their "mobile studio" from the parking lot of Shortstop Deli, as they talk about their own experiences with eating Ithaca, and devour some hearty PMP and WGC favorites with gusto and explicit exclamations of appreciation that would make dear Bob Petrillose blush. This episode of Eating Ithaca is for all the caffeine lovers out there, as we’ve got an exclusive interview with Gimme! Coffee founder and CEO, Kevin Cuddeback. 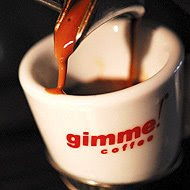 Kevin is totally committed to sharing his enthusiasm for great coffee with as wide an audience as possible, and it is that drive and ambition that has quickly made Gimme! an important part our local dining scene. And with their recent expansion into NYC, it seems Ithaca is going to have to learn how to share its own little special source for top quality espresso with the rest of the world. Enjoy this latest episode, and we’ll be back soon with new Ithaca A-Z restaurant reviews and more. Remember, if you have someone you’d like us to interview, send us an email with your suggestions. Download, listen, participate, and enjoy! Details on the Clover coffee brewer here and here. We're back in the home studio and there is so much to talk about we had to make a supersize episode! Unfortunately Ari couldn't make it to the taping this time, but Andrea joins the show to share her food favorites with us. And our continuing journey through the every restaurant in Ithaca from A-Z leads to a conversation about the merits of local mainstay The Antlers versus national chain outpost Applebee's. Who do you think comes out on top? Plus, we have sneak previews of the events coming up for local foodies and what's next for Eating Ithaca. Don't forget, we'd love to have your input. Send us an email, leave a comment, or give us a call (206-312-4746) and let us know your candid thoughts about the restaurants we're reviewing and feedback on the show. Download, listen, participate, and enjoy!